In preparation of the International Conference on Artificial Intelligence and Law (ICAIL), the Cyberjustice Laboratory of the Université de Montréal will be hosting a number of scientific events dedicated to artificial intelligence. One such event, the Graduate Law and Artificial Intelligence Conference (GLAIC), will be held on February 25, 2019 in Montreal, Canada. The conference is open to current doctoral students, recent graduates, early-career academics and professionals who specialise in law and technology. The conference is intended to provide participants with a stimulating environment to discuss their work and to facilitate future research and professional collaborations between young scholars and practitioners under the auspices of the Cyberjustice Laboratory and beyond. 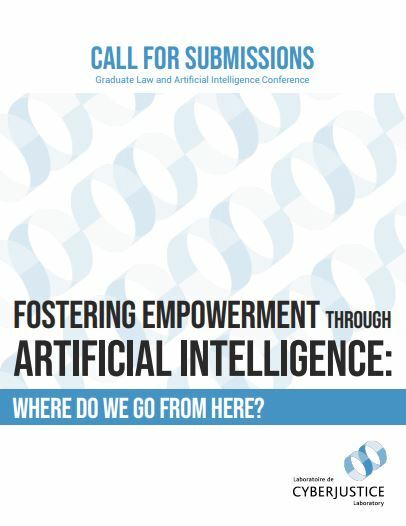 Fostering Empowerment through Artificial Intelligence: Where Do We Go from Here? The GLAIC solicits input from a wide variety of disciplines, including law, computer science, political science, philosophy, sociology, just to name a few. The applicants are encouraged to send submissions that tackle one or several of the rubrics suggested in the Call for Submissions. Ce contenu a été mis à jour le 30 août 2018 à 13 h 14 min.